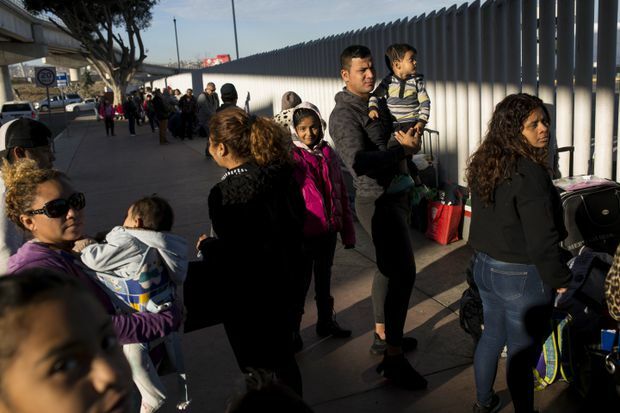 Migrants wait in line in Tijuana, Mexico, to receive a number as part of the process to apply for asylum in the United States. Migrants travelling in a caravan from Central America have made their weary way to the U.S. border, stepping onto the soft sand of the beach in Tijuana and up against the hard reality of immigration to the United States. The first busloads of migrants rolled into town on Sunday, and dozens more buses arrived on each of the next days, until about half the caravan – some 2,800 people – had reached the city by Friday evening, and the local government scrambled to house them in sports centres, its existing migrant shelters already straining at the seams. The migrants, muted, grubby, their faces thin and sunburned, say they will wait until the entire caravan has reached Tijuana to plan how to proceed. Their decision-making is organic and difficult to follow from the outside; this may mean waiting for the arrival of the other half of this first group that set out from Honduras on Oct. 13. Or it may mean waiting until their numbers are swelled with two other caravans – of 1,000 and 1,500 people – that are working their way through southern Mexico. But they have, ultimately, only a handful of options. “I think 30 per cent will try to make an asylum claim and 40 per cent will cross to the U.S. in some other way,” said Cesar Palencia, who is in charge of migrant issues for Tijuana. By “some other way,” he meant the human-smuggling industry that thrives along the border, its prices climbing steadily as the Trump administration erects more barriers and reduces the options for crossing. The migrants could go home once they find out how difficult it will be to enter the United States, but Mr. Palencia said they rarely make that choice. This is a city of migrants – people will tell you that no more than 10 per cent of the people who live in Tijuana were born here – and for decades it has accommodated tides of people who end up here, in a city defined by its relationship with the U.S. border. Some arrived with dreams of crossing and never managed it; and others were deported from the United States and want to stay near family or the life they had. There are Tijuanenses from all over Mexico, and in recent years, large communities from other parts of the world. A neighbourhood called Little Haiti is full of refugees from Haiti who did not make it into the United States. There are also blocks of cheap hotels and decrepit rooming houses that are home to Ukrainians, Somalis, Bangladeshis, Venezuelans and Syrians – those displaced from disasters and conflicts around the world – waiting to try to make an asylum claim. At the border crossing called Chaparral, migrants who are not part of the caravan keep a list in a battered notebook enumerating each person’s place in line in the weeks-long wait for their appointment with U.S. officials. On Friday, it had 3,108 names; the average wait is nearly three months. Between 30 and 50 people a day are called for a “credible fear interview” – in which they must demonstrate they have a realistic belief they could suffer harm if forced to return to their country. If they pass, they are taken into detention – and go into the backlogged asylum system that could take as long as two years to adjudicate their cases. But Camila Hernandez, a soft-spoken 28-year-old Salvadoran who has been in charge of the list for the past couple of weeks, said that as many as 90 people a day have been called recently for interviews – the migrants believe that U.S. border control is adding extra staff to deal with the caravan. But they are not entirely pleased about the new arrivals. The months of waiting in Tijuana are an uncomfortable limbo. Few of the Africans, Asians or Middle Easterners who are also there speak Spanish and there is a great deal of broken-telephone translation in the line. Even Latin Americans such as Ms. Hernandez, who fled her home in San Salvador three months ago, when a gang threatened her family with death for failure to pay extortion, struggle to find any work or pay for a place to live. And they must spend long days on the sidewalk in the shadow of the white concrete footbridge to the United States waiting for their number to come up. The family has made an asylum claim in Mexico while they wait to hear about the options for crossing to the United States. And if need be, he would stay in Tijuana, he said. “The priority for me, for all of us, is not to have to go to back to Honduras." Despite Tijuana’s migrant tradition, the caravan has not been met with undiluted warmth. On Wednesday, a small group of angry protesters confronted the first busloads of migrants who went to the beach, which stretches along one of the city’s wealthiest neighbourhoods. On Friday, mayor Juan Manuel Gastelum called the migrants “a tsunami” and said the city would consider using roadblocks to prevent more from arriving. He speculated – without providing any facts – that some international force was paying the migrants to travel to the border as a destabilizing influence. But her larger worry was about what they would do when they learned more about the realities of the border. “They have been misinformed,” she said. “They think everything is simple. They have illusions. And they are going to suffer a lot.” Few of those she has talked to understand the asylum process – or that fewer than 10 per cent of Central Americans are successful in their claims – or understand how hard life is in the United States, even if they have entered through a legal process. The westernmost point of the wall separating the United States from Mexico starts in the sea at Tijuana, a row of tall metal fence posts corroded by salt air, separating a boardwalk of restaurants and shops on the Mexican side from an estuary on the California side. This past week, a U.S. border patrol team topped the wall with rolls of concertina wire and stacked barriers in the sand. Agents in full military camouflage, their faces covered, paced the sand carrying assault weapons along one side, while bemused Mexican families on the other side gathered to picnic and watch.